Estee Lauder Double Wear 4W1 'Honey Bronze' - Cult favourite of oily skin girls. This foundation has SPF 10, provides medium to full coverage, long wearing, and the shade range offers 38 shades and varies from warm, cool, or neutral undertone! So basically covered the colors of the rainbow. Even though the foundation claims to be full coverage, the finish looks natural and it does not feel heavy on the skin. I can get away without any touch ups for a good 7 hours until my natural oils starts to peek through. It dries a bit quickly so working by section is advisable. I find that the foundation wears beautifully throughout the day and the longevity is insane! I once worked out and played badminton whilst wearing the foundation, oh boy! It withstand the heat and sweat which was not joking when it said long wearing! My only complaint would have to be taking it off. You will need an oil based cleanser or makeup remover and I would advise to not double cleanse but triple cleanse if you could to really take off the foundation residue. Other than that, it is an amazing foundation! Another thing to keep in mind when wearing this foundation is to avoid flash photography! It can cause a really bad flashback! Marc Jacobs Re(marc)able Full Cover Foundation 54 'Honey Medium' - This foundation is quite a new discovery for me. I purchased it 2 years ago and never went back since! 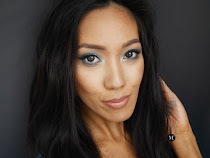 If you want full coverage, this foundation offers extreme full coverage! Concentrated pigment of this foundation gives an extreme coverage therefore, a tiny bit goes a really long way with a matte finish. It offers 22 shades which is a decent colour selection for a foundation and the shades run quite yellow/warm. 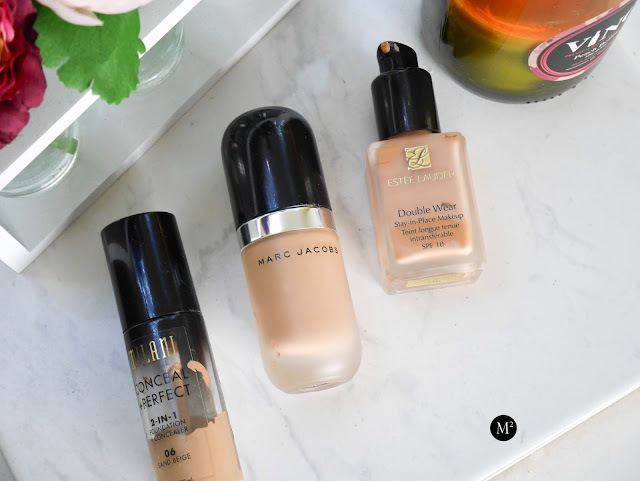 Like the Estee Lauder Double Wear foundation, this foundation claims to last up to 24 hours which I have not tried yet, but it definitely lasts until you take it off. It does not claim to be waterproof but I find that it does not run or fade throughout the day. I once wore this foundation for 15 hours and have not blotted one bit. The foundation is very thick and it dries rather quickly so working in sections would be advisable. My skin looked very flawless in person and in photos. Since it does not have any SPF, this does not have any flashbacks which is amazing for special occasions, events, long working days. The packaging is the major flop because it can get real messy which ends up wasting quite a lot of product. Price range is quite steep, so if you're willing to spend money, I'd highly recommend this foundation! An oil based cleanser or makeup remover is a must to remove the foundation. Also triple cleansing if you can is also a great option to really get rid of foundation residue. 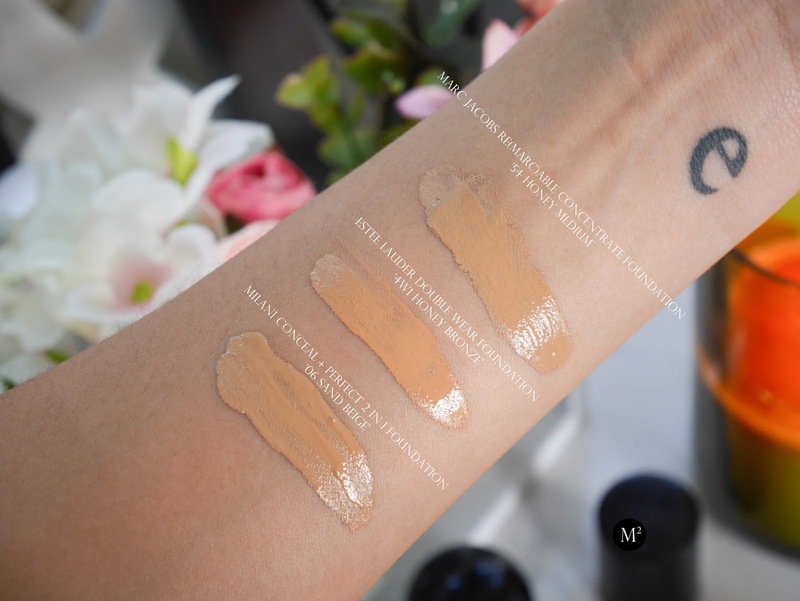 Milani Conceal + Perfect 2 in 1 Foundation 06 'Sand Beige' - The best foundation from the drugstore! Not only it is a foundation but it is also a concealer in one! It offers 19 shades which runs a bit yellow and quite dark even for the palest shade. If you're in the palest side, maybe avoid using this foundation, though they recently came out with few lighter shades. Out of the three foundations, this wins for packaging because it has a pump for mess free application! Major points for that! Coverage goes from medium to full, long wearing, and water resistant. The consistency is very thick and a little goes a long way. It also gives a natural finish, and can feel quite heavy when applied too much. Slight disagreement with long wearing because after 6 hours of wear I had to blot. I'd say this is a good dupe for the Estee Lauder Double Wear foundation. For everyday wear, this is an amazing foundation and you can never go wrong with the price! It only retails for $10 USD, and that of course depends on where you purchase it from. Here in New Zealand, this foundation retails for $21 NZD which is pretty affordable. Whenever I take photos, this foundation looks so flawless and I love the fact that it does not contain any SPF which I can fully say is safe for flash photography! On good skin days, I can get away with just spot concealing using this foundation and I'm good to go. Again like the other two foundations, you will need an oil based cleanser / makeup remover. Also triple cleansing must be considered. For reference my skin type is oily / acne prone skin with slight sensitivity. My color match is NC42 from MAC and I have medium tan with yellow undertone. 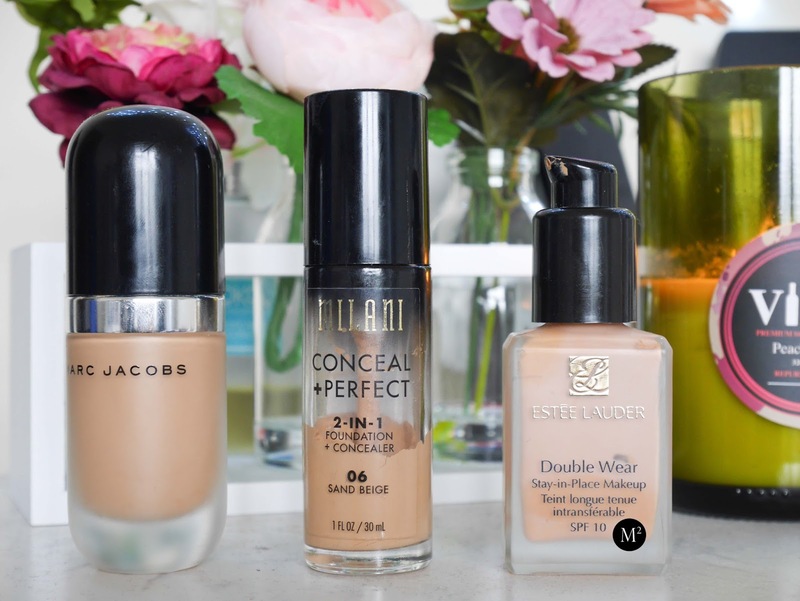 These are the foundations that I truly love and would immediately purchase without a doubt! And I would highly recommend for my oily skin girls that are looking for great full coverage and long lasting foundation! So good to see reviews where the products are so well-used! I have been meaning to try that Marc Jacobs foundation for ages but I'm worried that as it's so full coverage, it'll be hard to guess the shade right when buying online.